If you're a visual artist starting out or struggling with mastering your business- then this is for YOU! 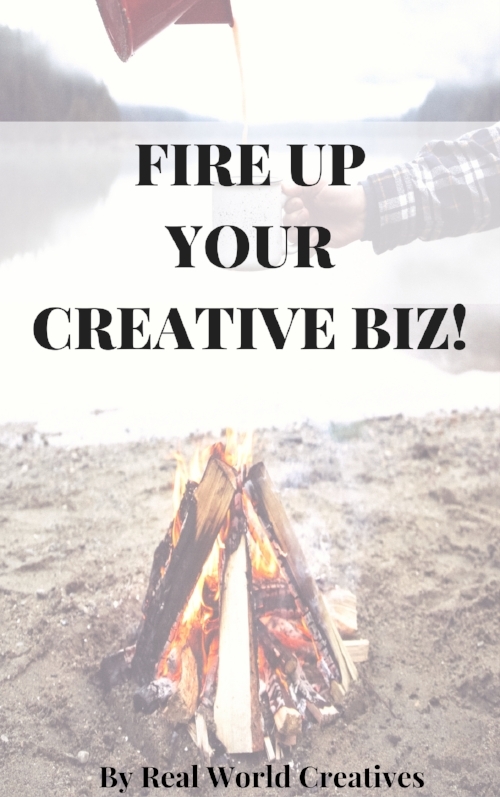 Fire Up Your Creative Biz is a guide for the basics and then some to make sure you're confidently tackling the important pieces that go into running a successful art business. Whether you're freelancing, taking commissions, selling online, or applying for exhibitions, there are certain things you MUST have in place. But we know it's not always obvious or easy for artists to figure out what they need. That's where RWC comes in to help you! Real World Creatives is dedicated to empowering visual artists with resources, tools, coaching and community so all artists can make art and money. An easy to understand and straight-forward intro to legally defining your business. Sole proprietor, LLC, what the what? I’ve broken it down so you don’t have to be a lawyer to understand your legal needs. Pricing! Who hasn’t struggled to figure out how to price their art? I give you my best advice from what I’ve learned and seen work for others, and how to make sure it will work for you! Networking dum, dum, dum… I give you suggestions for where to network, who to talk to, and how to do the most important part, which has nothing to do with awkwardly handing out biz cards in a room of strangers. You want great clients who will pay you right? I give you what you need before you can find them, and how to get paid what you want. What’s your ultimate goal and how do you possibly figure out all the steps it takes to get there? We talk big art-career visions and how to goal set in a way that works. Finally I give you some of the best techniques I’ve got to stay mentally and emotionally together while pursuing an art career. It won’t be rainbows all the time, but we can train our brains to stay happy, motivated and capable of quick turnarounds after tough times. This e-book will save you hours of research, confusion and underpaid experiences most artists have to go through to find the right resources, information and advice relevant to visual art businesses. Just for you! This e-book is available exclusively here for the RWC tribe. Get it now for just $13! Hi! I'm Sonya the founder and chief creative of Real World Creatives. As a photographer I started out struggling with all the things typical artists go through. Can I make art when no one is asking me to? Can I apply my skills to the real world? Can I actually make money doing my creative passion? But it wasn't exactly easy to figure that out. And I know there are SO many talented artists not making a living from their craft because they haven't been taught what they need to be successful. We artists are businesses. So it's about time we embrace that and get the education no one thought to give us. As a business coach for creatives, artist mentor and speaker, I focus on empowering artists with business savvy, tools, insight and mindset techniques so they can live a life they're PROUD of. I'd love to work with you on your art biz journey and help you get known for your art! Ready for more than an e-book? Check out the other ways artists can get support!